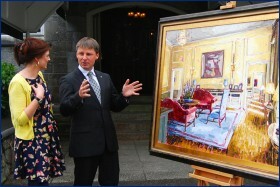 Roisin O’Farrell is a talented Wicklow artist who has turned the recession to her advantage. Made redundant in 2008, she turned her passion for painting into a way of life. Using a palette knife and a brush, Roisin works in vivid colour to find the beauty in everyday imperfection. See her work for yourself at The Park Hotel, Kenmare, where some of her most recent works are now on show. 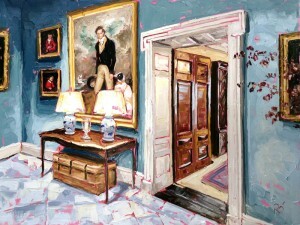 Given the theme of the exhibition the setting is perfect, The Park Hotel, a member of Ireland’s exclusive collection of Irish Country House Hotels – the Blue Book – and all of the paintings in this exhibition are of interiors of Blue Book houses. The exhibition runs from July 5th, so feel free to call to the Hotel anytime to see this magnificent collection of works. If you call by from 5pm to 7pm on July 5th you can even meet the artist herself, and discover the inspiration for your favourite works.